The first lighthouses were built to mark the anchorages and channels used by seagoing vessels trading between New Orleans and Mobile. The Cat Island channel and the Pass Christian channel were on the Coastal mail route and were the first locations to receive light towers in 1831. In the early 1800s, a large portion of the cotton that was shipped from Mobile to Europe was taken through the Sound to New Orleans or to New York before crossing the Atlantic Ocean. By the mid-1800s, Gulf Coast hotels had become popular “watering places” for vacationers seeking health spas, entertainment, and comfort. Captain John Grant of Pascagoula, dubbed the “Father of Gulf Coast Transportation,” erected the Gulf's first private lighthouse at Tower Island, which was also the location of Fort Powell. Both the lighthouse and the fort were destroyed during the Civil War. 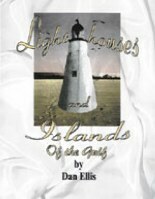 “Lighthouses and Islands” was Dan Ellis’s 11th release in a growing series of books that emphasize significant aspects of the Gulf Coast. All of his books are graphically displayed with many maps, diagrams and photos which capture the essence of each community or topical point of heritage. This book presents the Mississippi Sound as the focal point with the channels that flow through it. Ellis traces the historical conditions and movements of the barrier islands and near-shore islands, including ownerships and residents during the past 300 years. 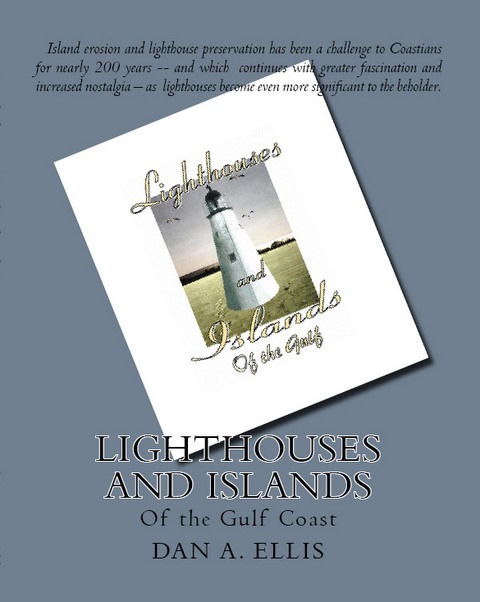 It includes descriptions of the lighthouses and their replacements since the first towers were built on the Coast. Knowledge of the Mississippi Sound need not be only the realm for commercial and sports fishermen. This book offers all Coastians a descriptive comprehension of the marine and ecosystem that Nature has provided. The winds and the tides and submarine currents are in constant action – moving and ever changing the islands – the natural Monuments of the Sea. From the early 1800s, these islands were the foundation onto which many of the first lighthouse towers were built. Island erosion and lighthouse preservation has been a challenge to Coastians for nearly 200 years – and which continues with greater fascination and increased nostalgia – as lighthouses become even more significant to the beholder.